Simple Solutions to Solid Wood Floors That Look Incredible! There is nothing quite as beautiful to me as a well kept solid wood floor. Many people decide to go with wood flooring because of the classic and sophisticated look, and not to mention the fact that it go with just about any décor you can throw at it. If you want your floors to remain as gorgeous as the day you installed them, it is best to have a care plan. It just so happens that we have come up with 3 easy steps that you can follow to achieve a fabulous Solid Wood Floor. Step 1: Keep Your Solid Wood Flooring Dry! Most of the time when we go to pick out what hardwood floor that we are looking for, we tend to get caught up in the resistance technologies and protection benefits and we forget that wood is naturally absorbent to liquids. It is kind of like putting a dress on a dog, it may be wearing human clothes, but it’s still a dog. The point of that rather far off metaphor is that regardless of what the wood has been treated with or the finish it has been given nothing 100% stops water damage. Not to say that there aren’t excellent quality finishing products available, and you should look for these, but that simply there is no way to completely protect from liquid soaking into the wood. It is very simple, just avoid getting it wet, and in the event that a pesky spill does happen on your solid wood floor, clean it up immediately. The longer that you have a spill sitting on the floor, the more damage it will do. Also if your house tends to be a little on the humid side, a simple solution would be to get a small dehumidifier for the room in question. You can find these anywhere and in the long run they can save you a lot of heartache when it comes to your floors. 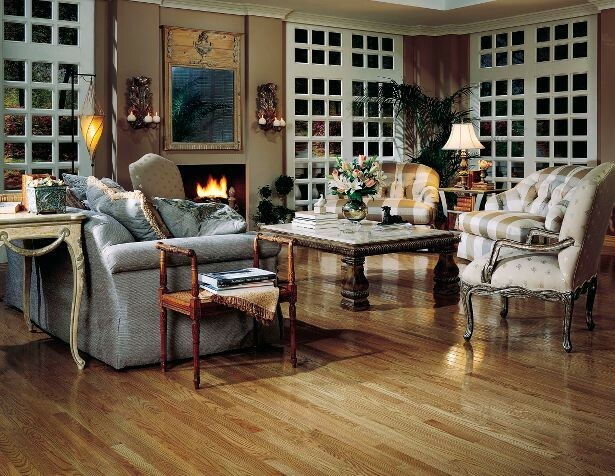 Step 2: Keep your Solid Wood Flooring Clean! In a normal day to day household your floors will acquire a substantial amount of dirt that you cannot even see. Did you know that you contribute to this factor, more than most any other item in the house? Your body is made of about 10 trillion cells, and your skin is about 16% of your body weight. In cells, that comes to about 1.6 trillion skin cells. Because your body is constantly shedding dead cells and creating new one an average person looses about 30,000 to 40,000 dead skin cells in an hour. Incredible, that is about 1 million skin cells a day. And where do they go? On your furniture, bed, etc. Mostly they go on the floor, and this is just you, that it is coming from. The fact is that so many variables take place in creating dirt and dander. This is why it is so important to clean your floors regularly. I recommend sweeping twice a week, and vacuuming at least once a week. This could be more in high traffic areas of the house. When sweeping, use a soft bristle broom, because over time if you are using a hard bristle broom you will eventually strip the wood’s surface layer by layer. Mopping is the most important thing to concerned with, when it comes to floor care. Why? Because most people mop with water solution, which cancels out step one. Mop with only wood solutions, they are made specifically for wood floors and usually require little to no water. So never use water to mop wood floors! Step 3: Keep your Solid Wood Flooring Protected! I’m not just talking about finish, I’m talking overall protection. Moving furniture, wearing heels, the dogs nails need clipped, etc. There are many variables that just work against you when trying to keep your floors beautiful. Heavy furniture can actually dent your floor over time because of the constant pressure on the woods surface you can remedy this to a degree by placing felt pads on the bottom of your heavy pieces. Take your shoes off when you get home and wear soft slippers, not only is it comfy on your feet, but it does wonders for scratches and indentations due to hard bottom shoes. Throw rugs and runners are also a great idea in heavy traffic areas, and they also look amazing on the floors, so this is a win-win situation. Heavy dents are almost impossible to get out with standard sanding, so if you take these steps you will not have to worry yourself with this. And finally further protect by keeping those dirt particles at bay by having door mats placed appropriately so we do not track it everywhere.